thanks. I'll be stuck for picking up a pint of milk. 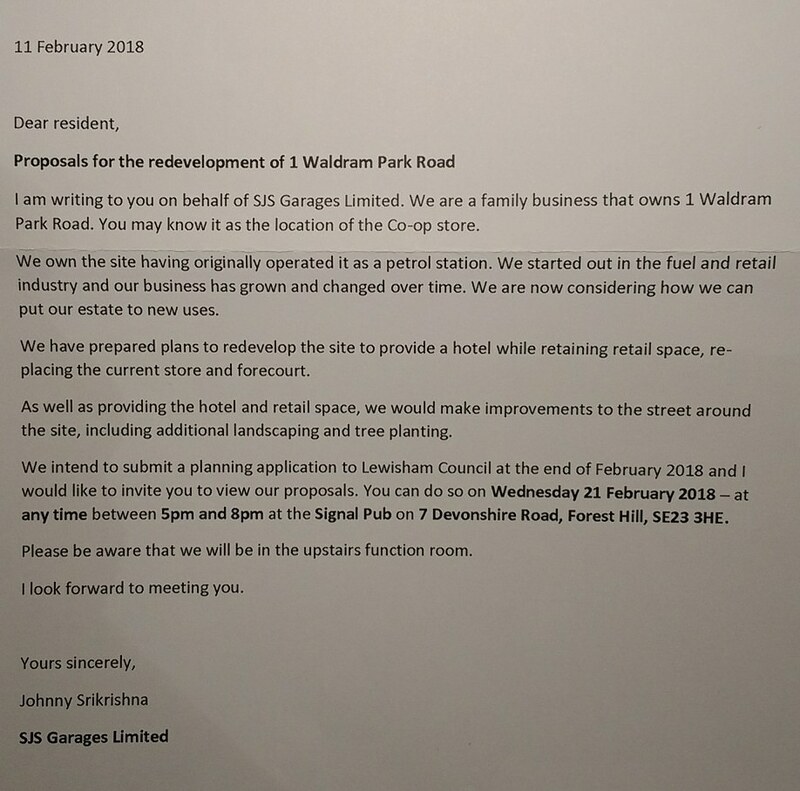 Can Forest Hill accommodate a hotel and will their be sufficient business to make it a viable venture. A much better option would be the former Harvester at Dulwich Common, an ideal site for such a proposed business. Presumably parking space would be a big issue - depends how big the hotel is. The Harvester site in SE22 was the perfect site for a pub/eatery. Until it went afire. Anyone would think the owners don't want to reopen it and would rather cash in on the development. I assume the same kind of thinking with the co-op in SE23 - presumably there is money to be made. It's very low rise but I would have thought (hoped?) there were restrictions on the height they could build to because of all the two storey houses around it. Well if the former PO exchange is anything to go by, that number of floors would presumably be allowed. Don't forget we are talking about Lewisham Council who seem to be very easy when it comes to getting planning permission. This post was last modified: 13-02-2018 05:03 PM by samuelsen. oh yeah. Lewisham. I've got an idea. Why not turn the telephone exchange into a hotel? Is the exchange used for anything or is it just empty? He doesn't own the Harvester at Dulwich, he owns the site in Forest Hill. There is probably sufficient demand for cheap hotel accommodation in the area, which the council will pay. The guests the council may send won't have cars so parking is not a consideration. Except perhaps police vehicles and they are not fussy where they park. The site at Dulwich Common is much more suitable. I would definitely support a hotel in FH and if priced suitably I'm sure it would work given the proximity to the station. In fact a new development would be a positive addition south of the tracks. The Old Harvester must surely be destined for residential use following a mysterious fire as seems to be the way of these things. Or is that far too cynical? Did anyone manage to attend this meeting? I only just saw this today. I for one would be very disappointed to lose Co Op and its car park, I use it to top up between bigger shops all the time. And rely on the car park to park there as it's a bit too far me on foot. Iirc, the former exchange is a site considered for a primary school. Really? I would have thought that putting a primary school there would result in the stunted physical and intellectual growth of local children with no choice but to inhale the fumes from the south circular. Not to mention the joys of trying to cross the road thereabouts. I guess we'll find out one day. I'm just surprised a small hotel would do better than a supermarket in prime position. I really liked that Co-op. It was my first choice. I would want assurance that it's going to be a real hotel rather than a seedy "pay-by-hour".